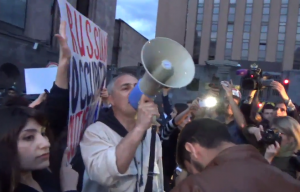 Demonstrations in Yerevan: Do Armenians Really Hate Russia? There have been anti-Moscow demonstrations in Yerevan over the past week or two. Some people have even thrown eggs at the Russian Embassy, despite the fact most Armenians owe their living to Russia in one way or another. Public rallies which are expressly anti-Russian must receive some sort of permission to be held, and in more authoritarian times this would not have been granted. They are therefore a sign (as were the electricity protests over the summer) that the government tacitly agrees with such sentiments, or at least wants to let Moscow know that they are there. The signal Russia is supposed to get is that Armenians do not like The Kremlin’s continued arms sales to Azerbaijan. As Russia’s is Armenia’s ally, this makes some sort of sense. But these sales expose the fault line in the relationship between the two countries, which has always been there and is always likely to be. These protests are not about Russia but about great power patronage itself. Armenia expects Russia, as its ally, to support all its foreign policy positions, one of which is the retention of Karabakh and its ultimate incorporation into Armenia. Russia is selling arms to Azerbaijan because it wants to keep the conflict frozen, a completely different perspective. As Russia is the great power, it will call the tune, and Armenians don’t like it. So what does the government of the small country in the relationship do? It can’t change Russia’s position, so it tries to show that it is counterproductive because it causes trouble. If that means destabilising the whole country in the process, that is a price it is prepared to pay. There are many scenarios of what might happen from this point onwards, but all of them involve a government abdicating its responsibility in order to pursue unrealisable ambitions, and have no benefit for the Armenian people, or anyone else who sees such behaviour as heroic. It is very unlikely that the protestors in Yerevan represent the majority view. Even if most Armenians support the continued occupation and ultimate reintegration of Karabakh, this does not make them anti-Russian. If Armenians have turned anti-Russian because they do not accept one thing that country’s government is doing, the Armenian government had better resign straight away because, as in all countries, you can bet that its own population disagrees with more than one thing it is doing. Political commentator Thomas de Waal doubts that the sentiments being expressed are representative, because the Armenian economy is basically dependent on Russia’s as a result of the international embargo over Karabakh. Most Armenians are grateful that Russia supports them when the rest of the world is told not to, and many of them (perhaps the majority) have relatives in Russia and live on the money they send them. So whoever is behind these protests, whether it is the Armenian government itself or another group the government wants to indulge, has one aim: to change Russia’s position by making it scared of what is going on in Armenia. This can’t be done diplomatically because here too Armenia is dependent on Russian patronage. Due to the international rejection of Armenia’s actions in Karabakh it only has any voice if Russia gives it one, as it does at the OSCE Minsk Group and other forums. No one will give it a platform if it goes it alone, even if starts complaining about Russia. This is evident to all, including politicians and diplomats, by the fact that the Armenian diaspora is so vocal. It is that diaspora, which by definition does not speak for the Armenian government, and includes people of a wide range of other opinions, which is most often quoted in reference to recognition of the Armenian Genocide and any other issue affecting the country. Its own lobbying mechanisms are far more effective than those of their native country’s government. Therefore Armenia has no political lever it can use to put pressure on Russia, and knows it. The only way Yerevan can influence Moscow is to destabilise Armenia itself. The suggestion that the country has become strongly anti-Russian as a result of the policy Armenia doesn’t like is itself controversial: as there are so many layers to this relationship, many of those who object to the arms sales will not go so far as to say they are now completely anti-Russian, and want to throw eggs at the embassy. Consequently it will provoke an internal debate which could readily be presented as “typical post-Soviet country turmoil,” though such debates occur in many other countries daily. Demonstrations also hit at Russia’s weak spot. The arms sales are intended to balance the conflict, and thus keep it quiet. If they provoke demonstrations they make it noisy, encouraging Armenians to want to take things into their own hands, the opposite of what Moscow wants. Moscow has lost a lot of ground diplomatically by continuing to support Armenia in defiance of an international embargo. This is another reason it is selling arms to the other side in the Karabakh conflict. Its own influence on both sides is what is keeping that conflict quiet, and the recent flare-up was also designed to remind people of its existence to keep it that way, before the world forgets and lets one side or the other finish it without protest. If Moscow cannot present itself as the peacemaker and keep the conflict frozen this will affect Russia’s position on other issues it is much more interested in. Any escalation of the conflict will be blamed on Russia, and therefore make it even more likely that the circle of NATO bases on its borders, with their weapons pointed at Moscow, will be extended. It will also encourage the international community to resolve the Ukraine conflict by granting ever-more legitimacy to Poroshenko’s chocolate soldiers, and their hired criminals from Georgia and elsewhere, which would rapidly destabilise the whole region. So Russia doesn’t want any trouble, but Armenia is now happy to see it. Whether Armenia has thought this through is another question, but with only one lever available to it there was always a likelihood that such demonstrations would break out, and take the organised form they have, which genuine popular demonstrations never do. There are of course many parties who want to embarrass Russia and are adept at fomenting demonstrations to further their policy positions. We need only to look at what the right-wing US think tanks are saying to get a feel for what may be going on in the region, and how disorder can be used by outsiders. When an acclaimed publication such as National Interest comes out with the statement that “Something should be said about Russia’s motives and its ambitions in the region, as well as the widespread belief on social media in Azerbaijan that, somehow, the Kremlin is behind the recent crisis,” alarm bells start ringing. If Azerbaijanis are blaming The Kremlin, rather than the Armenians, and now Armenians are demonstrating against Russia too both sides allegedly have a common enemy, rather than the common friend they have in arms and economic practice. This would make it possible for the West to resolve the Karabakh problem by reorienting the two sides to fight together against Russia, sharing their resources in Karabakh for this purpose, but on the West’s own terms, of course. Frozen conflicts are not succeeded by chaos. A solution is imposed, one way or another. If Russia is made out to be the common enemy, enough forces within both Armenia and Azerbaijan will look for the most anti-Russian forces they can find to help them, as always happens in civil wars, which inevitably become proxy conflicts between external sponsors, the present Ukrainian conflict being as good an example of this as the one always cited, the Spanish Civil War of 1936. The West has also wanted to keep Karabakh frozen for now. But it is far more interested in Russia than Karabakh. It may have decided that is has more to gain by destabilising Armenia, and giving it an excuse to take action against Russia, than it has in waiting for another day. It is too early to say that the Yerevan protests definitely reflect a Western agenda, but they suit the West and not Russia, and a final solution both Armenia and Azerbaijan could accept, even if imposed, would get it out of the region with honour and all guns still blazing, as it has in Afghanistan, Iran and other countries. The status quo in Karabakh has suited Armenia more than Azerbaijan over the last 20 plus years. Armenia has protected its fellow ethnics, quietly pursued the near-universal Armenian ambition to create a Greater Armenia out of all lands in other countries with an Armenian majority and gained a more effective international partner than the West has been to other countries in the region. Azerbaijan, meanwhile, has lost a big chunk of its internationally recognised territory, with this recognition itself being a problem as it makes the country seem occupied, weak and vulnerable to further encroachment. So demonstrations which can split the people, risk the country’s livelihood and provoke further conflict are not in Armenia’s interests either, unless there is one other factor at play. If Armenia thinks it can win the Karabakh conflict, and Russia is stopping it, these demonstrations, tacitly supported by its government, would lead somewhere. But what grounds does it have to think this? If Armenians are being encouraged to think that they are better off distancing themselves from Russia, and that Russia’s arms sales to Azerbaijan are the big obstacle to the country, some promise has been made. It would have to have been a substantial one, or at least big enough to buy off the politicians. If Armenia thinks Russia can be swayed by the destabilisation of Armenia, and that it can face it down in a conflict, it must have a very powerful sponsor, or at least one which thinks of itself in that way. Last year it was reported that some Armenian churches in Turkey, unused and neglected since the Armenian Genocide, were being restored with a view to reopening them. At the time, this was considered a philanthropic gesture by a country still embarrassed by that genocide. Maybe there is still no such thing as a free lunch, particularly when all the regional resources of NATO are happy to pay for it.